Every year around Thanksgiving, there's this awesome salmon run in the Humber River at Etienne Brule Park. It's just north of the Old Mill Bridge at the weir. You see hundreds and hundreds of salmon trying to swim up the weir and it's pretty fun to watch. 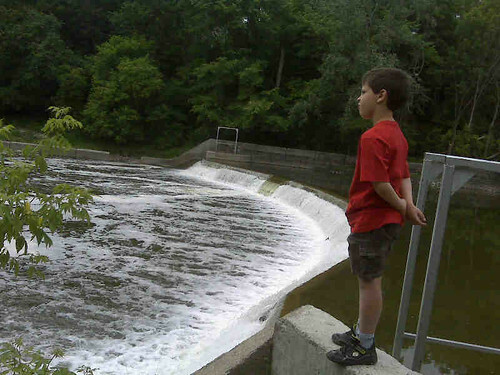 Today, as my son and I walked along the Humber River, we could see carp jumping by these falls. It's nothing like you see in early October with the salmon, but it somehow manages to fascinate us both. Aren't those carp? They look like carp to me. For those that don't know, I am referring to being there and not looking at the picture. I live 3 minutes form this exact photo. Pete, they could be carp. To be honest, I'm not much of a fisherman. I know the salmon run in October, so I assumed these were salmon. But maybe they're carp? Mike, Carp are spawning now.